"The Most Cost Effective Form Of Advertising On The Planet"
Imagine how great it would be….. to advertise only to people who are interested in your home and only pay when they click through to view your web site. That’s exactly what you get with Google Adwords. You write a small text advert like this one. You give Google a list of phrases that people use to find your home. 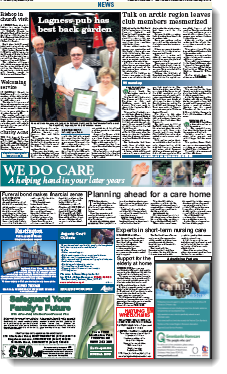 ‘Care Homes in Leeds’ in the example above. When someone types in one of your phrases Google shows your advert as on the page above. This is called pay per click (PPC) advertising and is the most cost effective advertising on the planet as you only pay when some who is actively looking for a home likes your ad and clicks on it. These people are highly qualified prospects and the most likely to become profitable new clients. Because you’re relying on the possibility that someone looking for a care home happens to be reading the paper on the day your advert appears and just happens to notice your ad among all the others. Then they need to take action and call you before the moment passes and this rarely happens. Google Adwords is one of the best ways to get your home in front of all those buyers searching for a care home in your area. 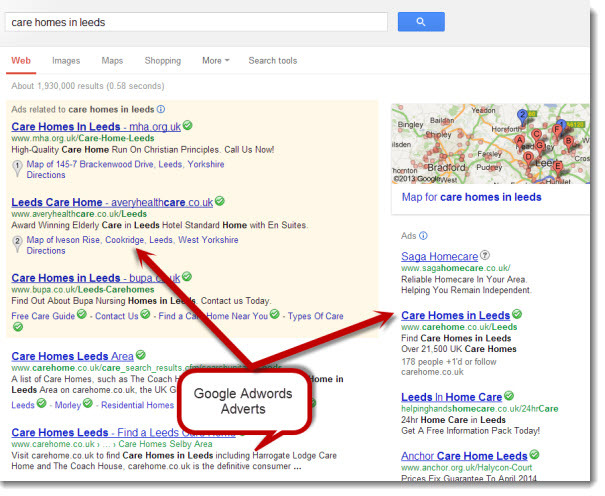 Set up of your complete ready to go Adwords account is just £349+VAT. If you’d like to start taking driving people searching for care homes in your area directly to your web site call us on 01977 232 233 or e-mail CareHomeMarketingExpert now.